Abby the Librarian: #48HBC is coming...! 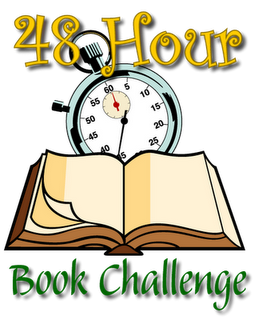 I've been working on getting my pile together for this weekend's 48-Hour Book Challenge! I've got some great books in the TBR pile and I'm excited to make time to read and blog this weekend. Honestly, I feel like between work and lots of social events lately, I haven't been inspired to blog or review books lately, but I'm hoping that this weekend's festivities will help me get back on track. Here's the pile I'm starting with and I'm hoping to add a few more books to it this week. I'm not aiming to read ALL of these books, but I like to have lots of choices on hand. I've got some galleys from NetGalley on my Kindle, too. I'm hoping to read at least five of these books and spend at least 20 hours reading and blogging this weekend. In previous years, I've posted all my reviews as I write them, but this year I'll be blogging snippets and scheduling reviews to post on later days. The 48HBC is always a fun event, celebrating books with a great community of book lovers, so if you need an excuse to set aside an inordinate amount of reading time this weekend, I hope you'll join us! I'll have an official kick-off post on Friday when I start my time, but until then I'd appreciate any other suggestion for new(ish) middle grade or YA fiction or nonfiction that I should track down and add to my pile! What are YOU looking forward to reading?